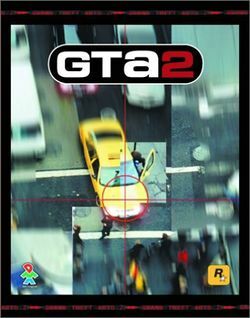 Grand Theft Auto 2, or GTA 2, is the second major installment in the Grand Theft Auto series. It was released worldwide on October 22nd 1999, by developer Rockstar North (then known as DMA Design), for the PC and PlayStation. A version for the Dreamcast console was made available, and later a toned-down version for Game Boy Color. The protagonist's name is Claude Speed. The game takes place in Anywhere City, which is divided into 3 sectors - Commercial, Residential and Industrial. In each of them there are three gangs, whose bosses give the player missions via payphones. Each district also has a maximum wanted level that the player can aquire, likely to make later levels more difficult. The Commercial District allows a maximum wanted level of four, which results in the S.W.A.T. team chasing the player, however, the Residential and Industrial districts allow a maximum wanted level of six, which results in the F.B.I. and the army chasing the player. After completing each level, the player unlocks not only the next district, but also one bonus arena. There are two different types, each with 3 arenas; Destroying Ice Cream Vans, and a time-attack mode where the player must race against the clock (killing pedestrians and gang members earns the player more time). Loonies (symbol: winking smiley face) - They appear in the first area and they are quite crazy. Their gang car, the Dementia, is a microcar with their mark painted on top and is probably named after their apparent insanity. Their small section of turf is in the vicinity of the city's mental institution, named "SunnySide" after the Mental Institution in Montrose, Scotland, near Dundee, where the game was originally created. Their boss is Elmo. They use surgical green as their gang color. Hare Krishna (symbol: an orange flower) - They appear in the third area and their car, the Karma Bus, is a big love bus with flowers painted on its roof. The Krishna's turf is around their temple. Their boss' name is Sunbeam. They use orange as a gang color. This gang also appeared in the first Grand Theft Auto game (the player would earn the Gouranga bonus for killing them), but were not involved in criminal acts.